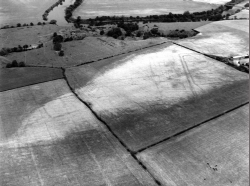 A series of cropmarks were noted at Quarry Farm in 1970. They were interpreted as belonging to an Iron Age or Romano-British farmstead and its surrounding field system. In the mid 1970s planning permission was granted for a large area of housing at Ingleby Barwick, developed as six 'villages' over the next 40 years. One of the last 'villages' to be developed included the area of the crop marks identified in 1970. 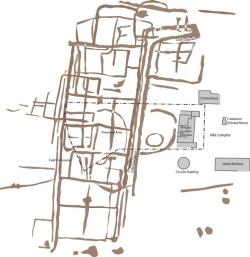 Initial investigation by geomagnetic survey revealed a series of stone founded buildings typical of a Roman Villa. This was a totally unexpected discovery. The developer of the site agreed that the main villa complex would be preserved beneath a 'village green'. The remainder was subject to archaeological excavations carried out by Archaeological Services, Durham University in 2003-2004. 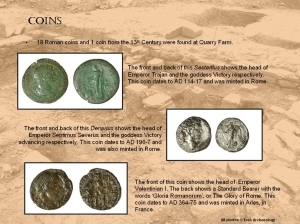 This was a major piece of archaeological fieldwork and its results are internationally important as this is one of the most northerly surviving Roman Villas in the Roman Empire. Although the principal building of the villa was not excavated, the surrounding structures (including a bath house, barn, mill and several corn-driers) were very well preserved and allowed a detailed picture of life on Roman Teesside to be painted. 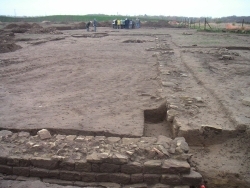 As well as housing a Roman Villa, the archaeologists found that site has been occupied throughout prehistory. Evidence from worked flints suggested that hunter-gatherers had passed through the area in the Mesolithic (c. 4000 BC). 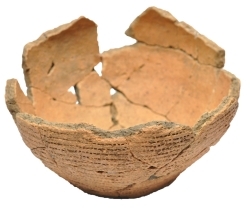 The remains of three Beaker pots from the early Bronze Age (c. 2200-1900) suggested that the area was used for funerary purposes in this period. Beakers are commonly associated with burials, often within burial mounds. One of the biggest surprises at the villa site was a small building to the east of the main complex with an under floor heating system. These are usually associated with bath houses or steam rooms. The room was very well constructed with stone pillars that would have supported a wooden floor above. This room suggests a social aspect to the villa and may have been used for relaxing and to conduct business. 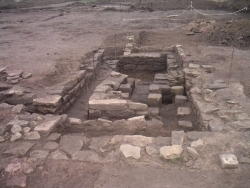 The aisled building is a type of Roman building found across eastern England, but the example at Quarry Farm is the most northerly one found so far. They are large multiple-purpose buildings with functions that seem to change over time. Typically they are used to store crops and equipment; provide cover for animals and as living and working quarters for estate workers. The building had one stone built wall which faced the main approach to the villa, suggesting that it was designed to impress. The other walls were timber on stone foundations. The finds from the villa included all the trappings of daily life including animal bones and broken pottery along with more exotic items. 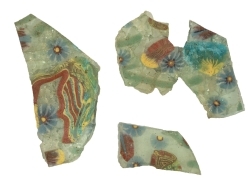 These small, colourful fragments of glass, shown right, are all that remain of a large shallow plate or dish. The base glass is colourless, but thin sections of multi-coloured mosaic canes have been embedded into the surface to create a floral design. This object came from Egypt, and presumably at great cost. 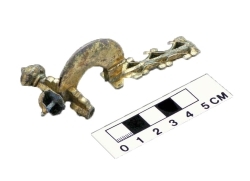 A Roman gilt copper alloy crossbow brooch (right) was another of the principal finds. This type of brooch was used by the Roman military and it was made in twelve separate pieces. It dates from the 300s AD. The object was found buried with the skeleton of a dog. Was the brooch an offering to a cherished pet? 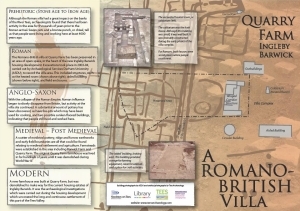 A downloadable leaflet is available about the Quarry Farm Roman Villa. A Powerpoint slide show has been put together for use by teachers and local groups. 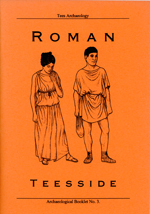 The Roman Teesside Booklet gives further information about the period with some specifics on the villa. It is anticipated that a monograph format book will be available by the end of 2013 (to be published by English Heritage).